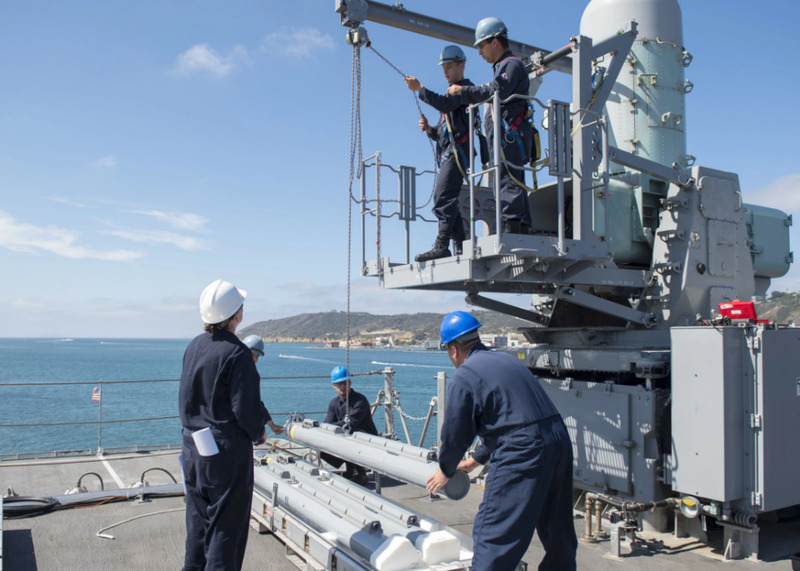 On Tuesday, the Navy announced that the USS Coronado had completed initial operational tests and evaluations with Raytheon’s SeaRAM anti-ship missile defence system, and in doing so, they answered a big question. Anti-ship cruise missiles have long been an area of concern for US military planners as China and Russia develop increasingly mature and threatening missiles of that type. Effectively, both Russia‘s and China‘s anti-ship missiles and air power have the capability to deny US or NATO forces access to strategically important areas, like the South China Sea, the Black Sea, and the Baltics. And that’s where the SeaRAM anti-ship cruise missile could potentially be a game changer. Building upon the already capable Phalanx close-in weapons system, a computer-controlled 20 mm gun system that automatically tracks and fires on incoming threats, the SeaRAM system simply replaces the gun with a rolling-airframe-missile launcher. The autonomous firing controls of the SeaRAM system, as well as it’s use of the existing Phalanx infrastructure, means that the system will have relatively low manning costs, and that its procurement was affordable. “The successful testing on the Independence variant (USS Coronado) demonstrates the self-defence capabilities of the ship and systems and installs confidence in Coronado as the ship prepares for its maiden deployment this summer,” said LCS program manager Capt. Tom Anderson in the statement. Currently, the Navy plans for the Coronado to take an extended deployment to Singapore. US Navy photoSailors assigned to the littoral combat ship USS Coronado (LCS 4) load a rolling-airframe-missile launcher onto the ship on August 12, 2015. “USS Coronado is designed to fight and win in contested waters, where high-end anti-ship cruise missiles pose a significant threat to naval forces,” Cmdr. Scott Larson, Coronado’s commanding officer, said in a NAVSEA statement.